(AFP) - Fresh heavy snowfalls and icy blizzards were expected to lash Europe Thursday as the region shivers in a deadly deep-freeze that has gripped countries from the far north to the Mediterranean south. Schools are shut and weather agencies predict the brutal cold will continue as the death toll from the freezing snap rose to around 48 since last Friday, with icy conditions causing accidents and endangering vulnerable rough sleepers. In the latest deaths, a 60-year-old man perished after falling into a lake in London, while an elderly Dutch skater plunged through cracked ice in the western village of Hank. The victims also include 18 people killed in Poland, six in the Czech Republic, five in Lithuania, four each in France and Slovakia, two each in Italy, Serbia, Romania and Slovenia and one in Spain. The Siberian cold front -- dubbed the "Beast from the East" in Britain, "Siberian bear" by the Dutch and the "snow cannon" by Swedes -- has blanketed huge swathes of the region in snow and played havoc with transport networks. In Scotland, which saw Glasgow airport closed until Thursday morning and most flights cancelled from Edinburgh, emergency services struggled to help drivers stranded for hours on a major motorway, with images showing scores of vehicles trapped in the snow late Wednesday. "This is a very difficult situation but everything possible is being done," Scottish leader Nicola Sturgeon said on Twitter. Further blasts of wintery weather are expected, with authorities in Ireland and normally-balmy southern France among those to have issued red alerts late Wednesday. Homeless people account for many of the dead, and cities across Europe have been racing to open emergency shelters to protect people sleeping rough. In Paris, where up to 5cm of snow was expected overnight, some 50 regional lawmakers were to spend Wednesday night on the streets to protest the "denial of dignity" suffered by those without roofs over their heads. And in the northern port of Calais, authorities were launching emergency plans to shelter migrants who camp out near the coast hoping to stow away on trucks bound for Britain. Schools were shut across Kosovo, western Bosnia and much of Albania, as well as in parts of Britain, Italy and Portugal. Ahead of a predicted thaw towards the end of the week, both Belgium and Switzerland marked their coldest nights of the winter so far. And in the south of France, motorists were stuck on icy roads as further flurries fell overnight. The Herault area was placed on red alert after a "major" snowfall, while earlier Wednesday residents in Biarritz and Saint-Jean-de-Luz zoomed down streets of the beach resorts on skis. 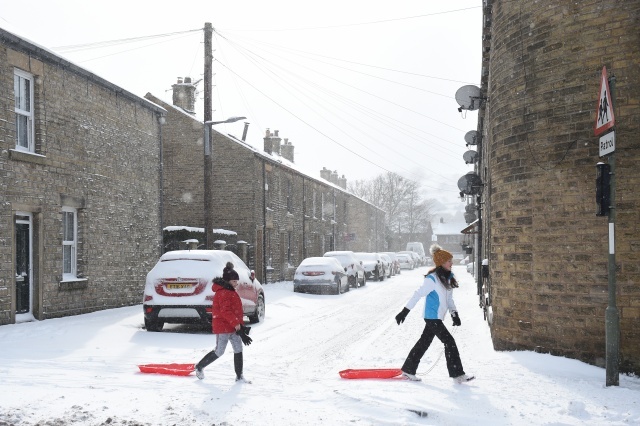 British forecasters predict extreme weather will continue to grip the country into the weekend. In Ireland, anxious residents were hoarding bread and milk as they braced for Thursday's arrival of a storm expected to bring the heaviest snowfall in decades. "It's fair to say the people of Ferrybank and Slieverue are taking the #Beastfromtheeast serious," said one Twitter post alongside a picture of empty supermarket shelves. Ireland's National Meteorological Service, known as Met Eireann, late Wednesday issued its highest weather warning -- advising people to "take action to protect themselves and/or their properties" -- for the entire country until mid-afternoon Friday. "Further heavy snow showers will bring accumulations of significant levels with all areas at risk," it said. Even professionals are feeling the chill. Austrians were reserving particular sympathy for Ludwig Rasser and Norbert Daxbacher, two employees at the Sonnblick weather station 3,109 metres above sea level. Handed the honour of having the "coldest job in Austria" by the Oesterreich tabloid, Rasser and Daxbacher are charged with heading out to measure the temperature three times a day. The process takes an hour in temperatures of -32C -- which "with the windchill feels like -60," Rasser said.